This last Sunday, yesterday, after seeing an advertisement on my Kindle, I used my Prime membership to 'borrow' a book, taking some time out for 'myself' to read something I wanted to read instead of a 'book for review'. How strange, huh! I plan on doing this very same thing in the month of September, too. NO review books, only books "I" want to read from my TBR PILES UPON PILES! (I'm sure I'll have a few 'for review' books I need to read in there, but that's okay.) So, here we go! Somewhere people act normal -- but not in the Downy Mount Mobile Home Park, where recently widowed Marfa Bacot lives with her mother-in-law Lulu, who cleans from hell to breakfast and has her make-up tattooed on so she's always ready for the rapture. As if it's not crazy enough inside the trailer, Marfa has to deal with the other eccentrics who populate the park, from the runaway polygs stockpiling water for the end of the world to the man who hears from extra-terrestials through V-8 cans to the domineering Don Ella, who runs the park with an iron fist and attendance-mandatory parties. Marfa dreams of a new life on her own outside Flagstaff, but first she'll have to let go of her old one. Helen Childress wrote the movie "Reality Bites." She is a seventh-generation Texan. First, there is NOTHING NORMAL about this Single at all! It's very funny all through the book, but nothing NEAR normal! Although, from the look of the cover, to the description of the book, I was expecting that! To correct the description, Marfa's mother-in-law, Lulu, moved in with 'her' inside of this 460 square foot trailer, 40' long and 12' wide, that's it. She liked her mother-in-law, but put two eccentric people together inside of a tiny space like this, and after a bit of time, someone is going to become irritated along the way, and it was Marfa, and myself! You can only take so much of Lulu, you know! This book was hilarious in most places! Marfa's mother-in-law has a language all her own which did make this Single a little difficult to read at times, but left you thinking about what she said, and there was NO figuring out what she meant more often than not, but it was funny! "Never turn anybody away , they may be Jesus - But Jesus she ain't." My favorite thing was this Sucrets container Lulu carried around with her everywhere! What was it? An ashtray! She smoked 120's because you get the most value for your money. (That's what I used to think back when I smoked! LOL!) She cleans 24/7 and NEVER stops! This irritated Marfa, and myself, again! This 40 page story was funny, but a constant funny is not always a good thing. It detracts from the story. If a little of the comedy was removed, perhaps we could have gotten to know the characters a little bit better than what we did. It's hard to do that with just a 40 page story, so I can't drop my rating because of that. This little story was meant for 'comic relief', or at least that is what it did for me! It was definitely different than what I am used to reading, for sure! I liked it. I would really like to see this book taken further and maybe even made into a full length novel. I think this author has the ability to do that, and I believe she could pull it off. Again, you have to remember, this is a Single, and it is meant to make us laugh, and laugh, I did! 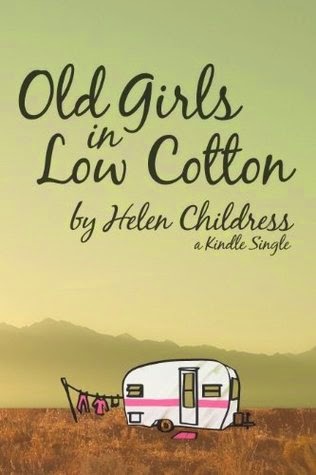 The author is Helen Childress. There is not much about her anywhere, and I even did a Google search about her. All that kept coming back was she wrote the movie, "Reality Bites" which aired in 1994. Wow! That movie has a LOT of big named Actors! Winona Ryder, Ben Stiller, Jeanne Tripplehorn (she plays an FBI agent in Criminal Minds now), and many more well known named actors. This was directed by Ben Stiller, too. I think this might be an attempt to get back into writing for Helen Childress? If so, I think she should give it a whirl! I see in other reviews my rating is probably among the highest, but I'm giving this author the benefit of the doubt. My other train of thought here was perhaps she is even writing again to get back into script writing again? There are a lot of possibilities for this author right now, and if taken the right way, I think she'll do pretty good. Now I want to re-watch the movie she wrote, Reality Bites, since I can't remember it 20 years later! LOL!